Finding victory lane in his SK Light Modified at Stafford Motor Speedway in 2016 has been a little bit more of a struggle in 2016 than it was for Joey Ferrigno in 2015. But it was pretty evident this week that after getting that first win of the season on Friday night, nothing much had changed as part of his post-win tradition. When it comes to the New England Racing Fuel Support Performer of the Week Award Ferrigno has a lifetime record of undefeated, and nothing changed about that fact this week. 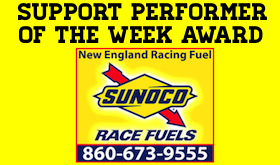 Ferrigno, of East Hartford, garnered 139 of 412 votes (33.7 percent) cast this week to win the New England Racing Fuel Support Performer of the Week Award. Brad Caddick of Wyoming, R.I. was second in the voting with 97 votes (23.5 percent). Caddick won Saturday’s Mini Stock feature at Thompson Speedway. Tony Membrino Jr., of Berlin, winner of the SK Light Modified feature Saturday at Thompson was third in the voting with 72 votes (17.5 percent). Ferrigno will receive a $20 certificate for race fuel from New England Racing Fuel. Mr Bottom does it again. Almost got Brad a second win in same week. 1 / 2 finish is ok also .